Latin - The ancient language of western central Italy, originating in a region known as Latium, from which the language draws its name, Latin is considered a branch of the many Indo-European languages. The spoken word probably existed for centuries among the local inhabitants before Rome was founded. But as the civilization advanced, the need for written communication arose. The Latin alphabet was adopted from the Greek alphabet (which in turn was borrowed from the Phoenician). As Greek culture expanded outside the Greek Peninsula (Magna Graecia) and into the Italian Peninsula, it was inevitable that they would make contact with the indigenous Italians. It's believed that the Etruscans were the first to get writing from the Greeks, and the early Romans got it from the Etruscans, with whom they had close contact. 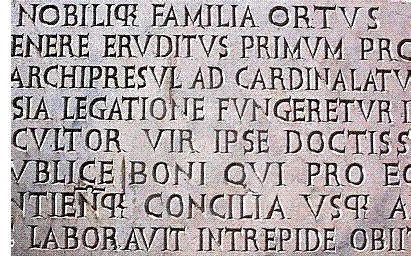 The earliest Latin fragments, called Old Latin, date from the period of the Roman monarchy (before 509 B.C.). As Rome grew from city to republic to empire, Latin evolved (into Classical Latin) and spread beyond Italy. It survived well into the Middle Ages, but today is considered an extinct language, although it is still spoken among the Catholic clergy. Of course, the Romance languages; Italian, Spanish, Portuguese and French (and a few others) are direct descendants of Latin. English is a Germanic language with a significant Latin influence.